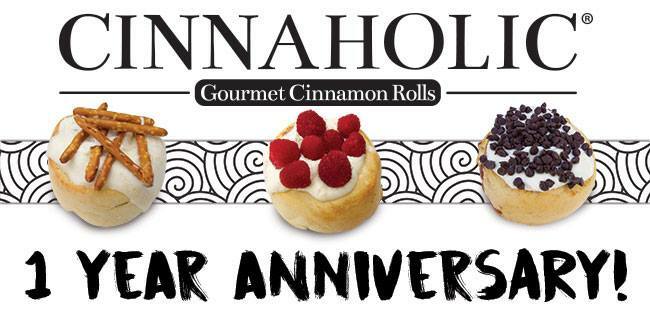 Cinnaholic features a massive selection of frostings, toppings, and gourmet cinnamon rolls await treat-seeking shoppers. The cinnamon rolls are dairy-free, egg-free, lactose-free, and cholesterol-free. The menu features specialty rolls—including fudge-brownie chunk and Cookie Dough Monster — or customers can design their own. Starting with a freshly baked cinnamon roll, they can adorn it with frosting available in flavors such as cream cheese, caramel, peanut butter and more. Then they can pick out toppings such as cookie dough, pie crumble made in house, fresh strawberries, or pecans before sampling their unique creations.